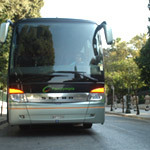 Panolympia consists of a dynamic corporation which is engaged in tourist and manpower transportation. Since its beginnings in the mid 60’s, we achieved a remarkable growth so as to acquire a fleet of 48 motor coaches and a high reputation in Greece and abroad for its consistency and high value services. With many years of experience in the tourism industry and an active and highly successful presence as a coach operator Panolympia represents a most reliable choice for any transfer and touring requirements. Our highly experienced staff perpetuates our commitment to quality in service and safety in transportation. In our privately owned technical base, a team of carefully chosen mechanics runs constant controls in order to maintain our buses in an excellent condition, while our highly skilled and friendly drivers guarantee our passengers with a pleasant and safe trip. All our coaches, latest models of Setra and Mercedes, are fully air-conditioned, equipped with mobile telephones and GPRS, while feature comfortable seats, large panoramic windows, television, DVD & CD player, toilet, and refrigerator. An excellent organisational structure supports a faultless communication between central offices, technical base, drivers, escorts and clients. Through frequent updates, precision and reliability is granted.Alert on a 24hour basis our bureau can be in continuous communication with both employees and customers. Alongside with our privately owned fleet of luxurious and modern motor coaches of different capacities we can assure our autonomy and thus flexibility in catering all kind of transportation needs.